The daughter of a 74-year-old Cookstown woman has hit out at the theft of her mother's handbag, which contained her weekly pension, as she was shopping in Cookstown yesterday. Caroline Quinn said her mother's bag was carrying, not only her pension money - which she had just collected that morning - but also her insulin, mobile phone, glasses and other personal belongings. Police said they are investigating the incident, which they said was reported to them on Tuesday, March 28. 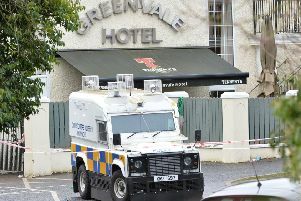 A PSNI statement said: "It was reported that a lady entered a commercial premises on Molesworth Street in the Cookstown area. Whilst inside the commercial premises, at approximately 3pm her handbag was taken. "The handbag contained a purse with a sum of money and bankcards as well as some medication and reading glasses. Enquiries into this incident are currently ongoing." Speaking to the Mail after the incident, Caroline said she wished to warn "elderly and vulnerable people not to leave their bags unattended in trolleys at any time". She said: "My elderly mother was in doing her shopping in Lidl Cookstown and got her handbag stolen out of her basket. "She had a substantial amount of cash, her glasses, her insulin and other personal belongings (inside). "This disgusts me that a vulnerable woman can't go in and do her shopping without this happening." Caroline went on to say that her mum has been left "awfully shocked and distraught". "(It) makes me angry that the poor woman is left without money until she collects her pension next Tuesday," she continued. "My mother is 74 and was coming from bingo and getting bread when she noticed her handbag had been taken. She had a substantial amount of cash in her bag as she collects her pension on a Tuesday morning. "Her insulin and glasses, her mobile phone and other personal belongings" were also in the bag, she said. A spokesperson for Lidl said: "I can confirm we do have CCTV footage, which was captured in store, and we are working with local police on the matter."